With the influx of some “11th hour filers,” the total number of local candidates for office in Clinton County alone hit the 61 mark at the filing deadline last Tuesday, January 30 at 4 p.m. Subsequently, two days later, on Thursday afternoon, February 1, position drawings for names that will appear on the May primary ballot were held in the County Clerk’s office. Almost half of local candidates are seeking office for one of the six magisterial seats. The county-wide races with the most crowded fields include five for jailer and seven for county judge/executive. In magistrates races, the heaviest ballot will be in districts one, three and four, where four, six and nine candidates, respectively, are in the races. Ironically, it will be winner take all (barring a write-in candidate) in each district as all candidates for magistrate have filed as Republican. The same situation goes for that of constable, as all candidates in the six districts, some of which are unopposed, are also all Republican. In fact, only two of the total candidates–one each for Clinton County Clerk and Clinton County Judge/Executive, are running on the Democrat ticket and both of those will be unopposed in May. Keith Dalton and Dan Thomas, both who have made previous runs, are seeking the office of county judge/executive and county clerk, respectively. Property Valuation Administrator (PVA) Pat Campbell; Clinton Circuit Clerk, Jake Station; Clinton Coroner Steve Talbott; and Clinton County Attorney Michael Rains. Constables unopposed include James W. Adkins in District One; David “Sidewinder” Cross in District Two; and Gilbert Daniel in District Six. All other candidates appearing on the primary ballot will have at least one GOP opponent. The following, in no particular order of office, will be how the candidates appear listed in order on the ballot in May. (It should be noted that all county-wide office holders are seeking re-election). Clinton County Judge/Executive: Republican: Daniel E. “King” Laib, Richard Armstrong, Lyle Huff, Lamon Hubbs, Ricky Craig, Scott Sheffield. Democrat: Keith Dalton. Clinton County Clerk: Republican: Sheila B. Booher. Democrat: Dan Thomas. Clinton County Sheriff: Republican: Jim Guffey, Jeff Vincent. PVA: Pat Campbell, Republican, unopposed. Circuit Clerk: Jake Staton, Republican, unopposed. Jailer: (Republican): Tracy Thurman, Richard Fuquay, Johnny C. Thrasher, Ernest Guffey, Clyde Stearns. Magistrate – District One: (North and East Albany): Bobby McIver, Johnny Russell, Wayne Hughes, Phillip Parrigin. Magistrate – District Two: Hayes-Maupin and Nora): Ray Marcum, Patty Guinn. Magistrate – District Three: (Piney Woods, Seventy-Six and Snow): Nick Dicken Barber, Brian Daniel, Christie Coop, Lucas Abner, Terry Buster, Jackie S. Stearns. Magistrate – District Four: (Cave Springs and Highway): Clint Sawyers Ray, Gary Ferguson, Bobby Thurman, Wayne Daniel, Sam Hadley, Ricky Clark, Jr., Lonnie Parrigin, Johnny Keith Riddle, Steve Booher. Magistrate – District Five: (Illwill and Speck): Hershell Key, David Harris, Jerry L. Lowhorn, Charlie J. Hardin, Johnny Shelley. Magistrate – District Six: (South and West Albany): Robin Braswell Clark, Mickey Riddle, Jim Pennycuff. Constable – District One: James W. Adkins. Constable – District Two: David “Sidewinder” Cross. Constable – District Three: Chris Conner, Terry Weaver. Constable – District Four: Charles Eddie Brunner, Ronnie G. Thrasher, Norman Default, Kenneth Brown, David Scroggins. Constable – District Five: Ronnie Appleby, Jerry Craig. Constable – District Six: Gilbert Daniel. An official sample ballot will be published a couple of weeks prior to the primary election and County Clerk Sheila Booher encourages anyone not registered to vote to do so and, also for those registered, to take time to vote in this year’s elections. Local non-partisan city and school board races will appear on the November ballot and those candidates do not begin filing until this summer. 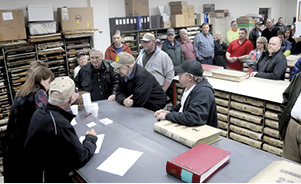 The documents room in the County Clerk’s office was packed last Thursday with election officials, candidates and observers as positions for the upcoming May primary election were determined. The order in which candidate’s names will appear on the primary ballot was determined through a blind draw of numbers from the cups seen on the table in the lower left portion of the photo.